Could the iPhone be facing a formidable competitor? According to Taiwan smartphone maker High Tech Computer Corp (HTC), it sold 800,000 units of its Touch cell phone, which launched back in June in Europe and Asia. "This is better than I expected ... We feel very good about our success," Chief Executive Peter Chou told Reuters in an interview. Chou was also quick to point out that Apple announced 1 million units sold for almost the same amount of time just a few weeks ago, which suggests the Touch might be competing admirably against the iPhone juggernaut. Touch detractors are quick to point out though, that the iPhone sold 1 million units in three months before it was even released to other continents. Regardless, HTC is extremely pleased with its sales to this point. Chou spoke in front of a crowd that was on hand to witness the launch of a new "touch" device, dubbed the Touch Dual, which uses both a keyboard and touch screen for navigation. Interestingly enough, HTC has signed on with Orange in France to offer the Touch Dual -- the same company that Apple is entering into a contract with in the country. Although the company has historically sold other company devices, HTC explained that its self-branded devices are helping the company enjoy much stronger revenues as the HTC Touch gains more traction. Unlike the iPhone, both the HTC Touch and the Touch Dual use Microsoft's Windows Mobile software. 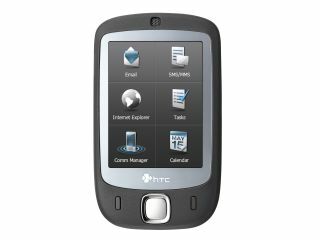 "At the moment, the HTC Touch is one of the most successful to use the Windows Mobile. It's very very popular," said Vassili le Moigne, business manager for Windows Mobile in Central and Eastern Europe.